Messier 82 in the constellation Ursa Major, which contains the familiar star group or asterism “the Big Dipper”. 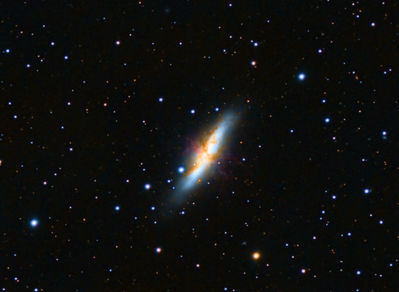 Messier 82 is a classic example of a starburst galaxy, in which is undergoing a high rate of star formation. This image was taken with a 130 mm f/8 Astro-Physics refractor and a SBIG ST2000xcm CCD camera on an AP1200 mount. Image was a total of 11 hrs 25 min exposure (137 x 5 min lights; 30 darks; 64 flats); Calibrated in Images Plus 5.0 and processed with PixInsight 1.8 and Photoshop CS6.